You will be given a reference e-book to read which has 209 pages And the test will be based on that e-book , you can take final test within 1 year of purchase. Journalism writing refers to the style of writing used in many news reporting media including newspapers, television and radio. It is a writing style which is far different from personal, academic and formal office writing. Journalism writing requires you to put the major points of your article in the first sentence and this should be written in a manner that grabs the attention of readers. The first sentence is then followed by the remaining details and all these should be written in a way that editors, proofreader and writers will be able to easily edit starting from the bottom upwards if it requires shortening. In order for you to become a more effective skilled journalism writer, you have to become aware that journalism writing does not only encompass proper sentence structure and vocabulary but also proper presentation of the information in your articles in terms of tone, intended audience and relative importance. Being a skilled and certified writer in journalism requires you to enroll in a journalism writing certification course so you will become more familiar about this type of career. It should also be noted that journalism writing should contain essential characteristics that are relevant to the intended readers or audience and these include prominence, proximity, human interest, consequence, oddity and timeliness. Journalism writing also requires you to write your articles in a more precise and explicit manner while preventing yourself from fully relying on jargon. Journalists are advised to prevent using long words when there are shorter words that are suitable to the contents of their articles. 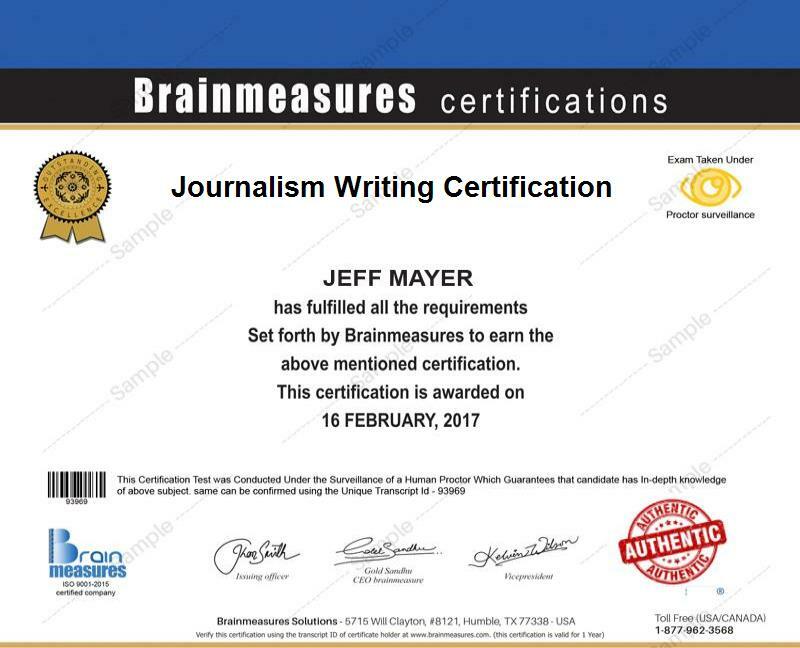 The journalism writing certification program from Brainmeasures aims to help individuals who wish to have a career in journalism. The certification course is most suitable for those who regularly write for publication and aim to receive practical guides on how they can successfully carry out their responsibilities and students and trainees who wish to become part of the journalism writing industry. The good thing about the journalism writing certification program from Brainmeasures is that it does not only target professionals. You can also expect it to benefit people who love to write for propaganda purposes, as part of their hobbies or to satisfy their passion for writing. Being a journalism writing certification holder gives you an assurance that you will be receiving a more stable flow of income. Your experience in the field of journalism writing can have a major impact on the amount of salary that you will be earning. If you are still a starter and you write at small papers, then it is possible for you earn around $20,000 to $30,000. If you work at medium-sized papers, then your earnings can be expected to range from $35,000 to $55,000. If you are already working at large newspaper publications, then your salary can start from $60,000. This can be expected to grow even more if you hold editorial positions.